JMG Bathrooms are an experienced bathroom retailer, providing new luxury bathrooms in addition to expertise and advice to homeowners who wish to transform their bathroom. We also supply directly to the trade, providing a reliable source of bathroom furniture and accessories that are available to you for installation on behalf of your customers. Our bathroom suites and accessories are of the highest quality, encompassing the pinnacle of each product range that the leading bathroom manufacturers have to offer. Whether you require your bathroom delivering to your address or are based within Middlesex and would prefer us to install it on your behalf, call us today to discuss your requirements for a new luxury bathroom. We provide you with the option of designing your own bathroom, allowing you to pick and choose the features you desire and in turn provide you with a bathroom that has been customised to your individual requirements and personal tastes. Our product ranges cover every aspect of the spectrum from cheap bathrooms to designer bathrooms, ensuring that you’re able to find something suitable for your needs. Whether you require the installation of a completely new bathroom suite or would instead prefer to replace or upgrade only certain aspects of your bathroom; we can assist by allowing you to order individual fixtures and fittings such as showers and bathroom furniture which you can tailor to your existing space. Simply call us today for more information. search below for the product you are looking for. JMG Bathrooms specialises in the supply and installation of market-leading bathroom equipment and accessories. We have a dedicated team available across the region to install full bathroom suites or individual pieces of furniture, whilst we also operate a nationwide delivery service for those further afield. 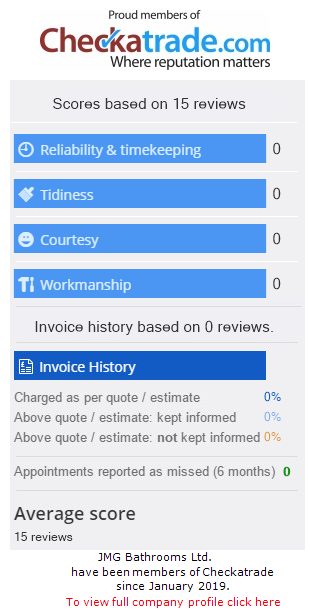 Tradesmen and homeowners have come to rely on us for high-quality products, efficient service and solid advice. Visit our showroom in Ashford today to see our product offering for yourself. Our bath store is located in Ashford, Middlesex, allowing both members of the public and the trade the opportunity to view our range of products first-hand. From there, your options include the ability to take your bathroom away with you or request that we install it on your behalf. If you prefer, we also provide home delivery bathrooms which can be delivered to any location in the UK. If you’re in the market for high quality bathroom accessories or a new designer bathroom, visit us at our bathroom showroom in Ashford where we can showcase our range and answer any questions you have. Alternatively, you can also choose to order online, allowing you to choose the fittings you require and have them delivered to your door.